When it comes to inspecting a property, one of the most important areas that you’re going to expect inspect is the inside of the property. 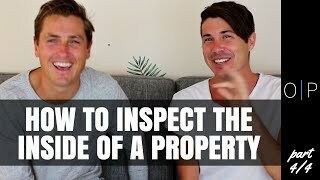 And so in this episode we want us to talk about how to inspect the inside of a property. And so today I have with me Ben Everingham from pumped on property. This is a part of the series that we did on inspecting your property. We have already looked at questions to ask an agent. We’ve already looked at inspecting the street as well as the exterior of the property. If you haven’t checked those out yet, go to on-property dot condo. You for sash inspect and we will list all the episodes over there so you can check them out. Um, but yeah, in this one we’re talking specifically about the inside of the property, which you’re going to want to do a thorough inspection of the inside because most often than not, the agent, we’ll walk you around and he’ll talk about the benefits or she’ll talk about the benefits of the property. They weren’t talking about the things that you actually need to know. You always walk through a property. We gave out really dark glasses on, like seeing everything that’s bad or really, really various of glasses on and the agents going to make sure that you noticed the rose colored stuff. So this is just again another way of making sure after the property you’ve got an accurate picture of what it looks like and I, I take 50 odd fridays per property they don’t inspect when I’m doing it for me because I just really want the non real estate.com version of what’s going on there. And nonprofessional, those that had been like photoshop, the color, everything like that might guide your eyes, the blue that. So yeah. So there’s a lot of stuff that we’ll be covering in this video, so we do recommend that you go through with a checklist of your own. Again, the power in this inspection is not just doing one inspection, but it’s in doing multiple inspections or different properties and then you can compare each property to each other and this will also help you when you’re doing it. Multiple inspections to not forget the property, forget what it’s like, which is definitely an issue. Had you present like that is the biggest issue that I used to face and then I had to jump on real estate.com in the order again and just re remember after saying 10, 15 properties in a day. And so the first thing that we want to look at is does the floorplan work? This is such a video on there’s so many houses where the floor plans just don’t work. Almost every property that was built again outside of the last three years had a floor plan that didn’t work in more than 80 percent of what’s being built now. full plan and while it hasn’t terrible one, unless the terrible one has an opportunity to knock down some walls and turn it into a great one, I will choose a completely unrenovated property with a great flow plane I’ve ever really, really nicely renovated property with a shocking one. And the reason I do that is when I was working for my previous company before I started this business, I was a marketing manager. We did a like basically a research study where we looked at 2000 Australians, moms and dads and what would the most important parts of behind for them. And it was the kitchen for the wife and it was the outside of the property backyard for the man. But what we found from doing that research was floor plan made everything work. And so when you walk into a place and it feels right, it’s not because the house is any better than anything else, it’s just the floor plan actually works and is meaningful and what we’re talking about there is a nice entry that feels open, are living, dining ALFRESCO backyard that opens out to itself good size bedrooms that are, you know, well located away from the entertaining area. So people feel like they’ve got privacy, like it’s very easy to create that sort of floor plan if you know what you’re looking for. Yeah. And also you can look for opportunities in the floor plan as to where the walls could be removed in order for you to improve that for planned. So many houses have these pokey little kitchens or a wall separating the living, dining, kitchen area. Sometimes I bring them up, can make the place feel infinitely larger. they don’t check it, the dishwasher’s working that don’t check the water heater check. Generally the air conditioner, they are probably the three largest maintenance costs on a property outside of a roof that you come up against regularly. So important I think to just double check that. And then if you know that the water heater is about the shoot itself, obviously negotiated a $2,000 discount or $5,000 piece, can’t be cover the replacement of that in the next couple of years. Yep. So you don’t want to look at the condition of the kitchen and you’re also gonna want to check if it’s gas or electric and then check it. The range hood is working. Yeah. Most French words aren’t checked in a building and pest stay there and that dynamic. in robes. But you were saying that the most important thing is the size of the room. It’s always about the size and the bedroom. And so it’s daddy and they do that time. Definitely the size currently, particularly in the master bedroom. You want your master bedroom to be a bit larger than that of the bedrooms in the Bronx. Well we’re talking about here is a master bedroom. Done it since being at least four by four meters wide if possible, and then as a minimum for the second two feet bedrooms in the property, I’m looking for something that’s at least three by three minutes as a minimum. A lot of our properties have smaller bedrooms because for some reason the mcmansion became something around about [inaudible] 99. He’s in Australia, um, in the case of bedrooms like is fully better and there’s a minimum size that people should be looking for that. Yeah. And so that size is really three by three for the smaller bedrooms and full life for, for the master bedroom. Um, and then also you want to be checking the fans and checking with a condition the built in robes and whatever else is in the bedroom as well because if you’ve got bedrooms that have no built in robes at all, then that’s going to be more difficult to rent out. Or you may need to build them. Yeah, like an in. And I think about an owner occupied home with kids in it and a family. Every room would have built ins. Every room we’d have fans, a home would have air conditioning days aren’t things that every property comes with. This is an ultimate wishlist, but if you really want that quality product, there are things you should consider. Yeah, and just sort of thing. Then we move onto the bathrooms and again we’re looking at how many bathrooms are in the property as well as the condition of those bathrooms. Bathrooms are huge maintenance issue. What you’re really looking for there and you can’t do it yourself unless you’re a qualified plumber, but the building and pest inspector in particular, bathrooms and major, you need to find out if there’s any leaking, if there’s any moisture behind the walls, if there’s any damage there because that can be a significant cost. The brie rip out a bathroom, waterproofing and build a new one. So just check the condition of the bathroom, check the seals, check the tap, so working, ask if there’s any issues. The building and pest is gonna. Pick it up anyway and then negotiate hard if there’s a bathroom issue because, and again, and this is all worth, we’re writing this stuff from zero to five. So rating the experience in the bedroom. Five, five days later, he experiences pain for a total of. Can I just share a bathroom experience with you that will be appropriate. We bought this property in a suburb 14 occasion. The city for one of their first clients came. She’s an absolute legend. I think you introduced this to Kim, I’m not sure. Anyway, she ended up going to buy 600 properties with us, um, over the period of four years and Kim effectively bought this home, which we helped her renovate and helped introduce her to the people that could help her renovate. And we’ve gone into the bathroom and we ripped it out. And as we’ve gone to pull out the shower, this was a house on stamps in Brisbane that was about 16 years of age. The would pull the chair out and the only thing underneath the shower was actually the frame and the tiles. The because of the moisture damage in, uh, in the south Florida and the flooring in a completely rotted all the timber out so that literally anytime someone was standing in that shell it was the tiles and the frame of the shallow keeping the person up and it was only because we proved it out that we actually figured that out. So it looked like an okay bathroom to me on surface level, like the house needed around it, but you don’t know what’s underneath until like you really start getting into some of this stuff. Yup. specialists in the property, which can obviously be expensive. Again, this is gone bad video the end of the day. old? Is the air con as well? It’s something to look at really important. Most air conditioners that you’ll find in properties that are a little bit older, we’ll probably need to be replaced definitely cleaned. Um, if you don’t turn it on and check it, you can’t negotiate on that if you need to and what? unity that can be better than properties without opportunity and there’s two types of properties. Effectively there’s a low maintenance property that could do with a cosmetic update and actually add value to it. And then there’s just a, you know, low maintenance property that has already had the update and that looks fantastic. So you’ve got to decide which side of the fence you sit on. Active investors, probably one day unrenovated property with potential to renovate it at some point in the future. More passive investors, um, or interstate investors might just some one time that they don’t have to think about it for five to 10 years. Totally integrated condition and it’s already been renovated. And they don’t have to do it and they’re happy to pay a bit more to not have to do that 10. Sometimes you actually don’t pay more for it. Like it’s crazy dude. Some people just overcapitalizing the market right now in Brisbane and they were doing the same thing in Sydney when we’re buying there four years ago. They don’t actually, they’re just completely under capitalized and then the market doesn’t value what they’ve done or they’re in financial stress or they’re going through a divorce. And so you can actually sometimes pick up like renovated properties, you know, below the replacement value of buying a shitbox and cleaning it up yourself. So it can be both sides, but it’s much harder to find that than it is to find that unrenovated place that you can add value to. And then the last item on the list was whether or not you could add a bedroom to the property. And so this was the strategy when you talk about where you buy like a three bedroom company, but there’s an opportunity to add an extra bedroom just by putting some walls in 100 percent. Like that’s a great opportunity to manufacturers some value in a suburb with four or $500. Um, you know, often a lot of those older properties built 10, 15 years ago had that media room that no one actually uses anymore or that living room where no one sits anymore and you know, you can put a wall up around some of those places, still have a great internal floor plan and get an extra bedroom might cost you, you know, five to 20,000 bucks to do that. But you know, you just have to look at the sales history in the suburb to say how much more life that is valued by the marketplace in terms of rent return plus actual capital growth or equity guy. Yup. And so that kind of covers how to inspect the inside of a property. Obviously there’s a lot of different things to look through. So you will want to go into that property with a checklist of your own and just that rating system from zero to five, which random a lot of losses. But just having that is, is really good. So when you go home and when you’ve been selected a few properties, you can really look at these and you can say on a scale what the quality of the property was and this is going to help you remember, hope you compare apples to apples and how you make ultimately hopefully make the best decision for you to buy the best property. One hundred percent. Like I know we’ve talked about a lot of different things, but like if you actually sit down with a pen and chuck this stuff into a spreadsheet or word document if can become really, really simple and it can just give you a framework or a process for inspecting properties which 99 percent of people don’t have and that’s where they come unstuck. And the reason we’ve got this is because I made so many mistakes myself on my portfolio and I’ve learned so much as a business from buying so much property in terms of what’s important for tenants that, you know, it’s just, it’s just worth doing that extra five minutes of work before you go out and check this stuff out. Yeah. And so that completes this series on how to inspect a property. We looked at questions to ask the agent, we looked at inspecting the street and surrounding area. We looked at inspecting the exterior of the property as well as the interior of the property. You can check it out, all these episodes at on-property dot com dot EU forward slash inspect so you can go through and that you can become a master at inspecting properties. This is not to replace building and pest inspections by any means, but this will hopefully give you a clearer idea of the quality of each property that you visit, which will help you make a better decision as well. Thanks so much for watching this series. Guys, again, get on property to you for Sacha inspect to check out the full series. Don’t forget to subscribe to the channel and until next time, stay positive.